With gilt. Gorgeous boat with lovely bucolic scene either side of the body. Backstamp: Adams W A & Co Est 1657 Cattle Scenery Ironstone. A few minor blemishes and the pattern on the far side is a little hazy. Underneath there is a very small chip to the foot. It does not sit quite flat. Printed in a light steely blue with an ochre rim this is a delightful little piece. It is crazed, there is some wear to the ochre rim,the crazing around the foot is a little discoloured and there is a small hairline inside to the base. Sounds pretty awful however it is a charming little piece. No backstamp. Later version. Little discolouration to the foot. Elegant boat with solid blue handle. Backstamp: Rd No. ..3294 This Pattern was introduced by William Adams in 1780 being a copy of a Chinese pattern & one of the first of its style produced in English Pottery Wm Adams England. There is some discolouration mainly to the rim and inside with just a touch on the outside. Light crazing with a little staining inside to the base. This boat is in superb condition. It has just one or two lines of crazing inside otherwise fine. Attractive boat on pretty shaped fixed stand. A little minor blue mottling inside the boat and a little wear under the foot otherwise in excellent condition. Attractive shape with solid blue handle. There is some wear and discolouration around the foot and the rim. Elegant boat. Blue printed backstamp. An unusual piece with the boat attached to the pretty shaped stand. Excellent condition. Blue printed backstamp. Elegant boat on an oval stand, both in excellent condition. Blue printed backstamp. This is an early example in this design. Typical blue printed backstamp Juliet over crown with Adams, Estd 1657, England beneath. Pretty boat standing on four small feet. Excellent condition. Lovely sauce boat however it has seen life! It is crazed and there is some light associated crazing mainly inside to the base and surrounding body, but also just a little showing through to the outside. A fine display piece. Barker Bros, Royal Tudor Ware. Really lovely boat with different rural scene printed either side of the body in a steely blue. Backstamp: Royal Tudor Ware Olde England Barker Bros England Permanent Underglaze Decoration. Excellent condition. Lovely boat with fluted body and in excellent condition. Blue printed backstamp Willow Barratts of Staffordshire England. Attractive boat with gently moulded body. Backstamp: Booths Made in England British Scenery A8024. A little minor wear to the foot otherwise excellent condition. Elegant boat with lovely rural scene either side. A little wear to the handle otherwise absolutely fine. Extremely elegant boat. it has a small firing fault inside otherwise is in excellent condition. An extremely elegant boat with a lovely rural scene either side, on a fixed stand which has the grapevine and wheat border pattern. Light crazing otherwise fine. With gilt. A8025. A little very minor light staining inside to the base, otherwise fine. Gilt beautifully intact. With gilt. 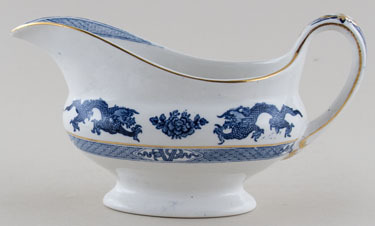 Very elegant sauce boat standing on oval foot. A few minor stain spots inside the boat and the gilt is worn around the rim. Majestic Shape. Blue printed WITHOUT gilt. Tiny nick and hairline to base of handle. Display piece. With gilt. An early example of this design. Lovely bulbous boat. A rare shape for Booths on four little feet. Blue printed with gilt decoration. Some wear around handle, glaze blemish under spout and gilt worn. Otherwise good condition. Pattern number 3163 and registered number 731515 for 1927. Such an elegant boat standing on an oval foot. A very small area of stain on the outside and a little mottling inside. An extremely elegant boat on fixed stand. Light all over crazing to the glaze, otherwise excellent condition. No gilt version. Backstamp: Booths Made in England Real Old Willow A8025. One or two minor printing blemishes otherwise excellent condition. NO GILT. A8025 excellent condition. With gilt. Backstamp: Booths Silicon China Made in England Real Old Willow. Some wear to the gilt and underneath a little brown mottling otherwise excellent condition. With gilt. Extremely elegant boat. Backstamp Booths Silicon China England and impressed Booths There are some glazing blemishes inside to the base and a touch of wear to the gilt otherwise excellent condition. Provenance: The Entwistle Collection. With gilt. Backstamp: Booths Made in England Real Old Willow A8025. Stand has light crazing otherwise both in excellent condition. With gilt. Sauce boat on a fixed stand. Backstamp: Booths Made in England Real Old Willow A8025. Gorgeous colours on this boat, blue printed under the glaze with the enamel colours hand applied. There is a little mottling and a couple of very minor stains inside otherwise excellent. A traditional silver shape sauce boat of most elegant proprtions. This boat looks stunning on display. It is in almost untouched, fine condition. It would be difficult to find a more outstanding boat. Blue printed backstamp of B on anchor monogram, with England beneath. Onion pattern. Fabulous double spouted boat on a fixed stand and ornate moulded detail at the handle joins. Backstamp: BWM & C Meissen and impressed Brown Westhead Moore. Excellent condition. With gilt. This popular series was named after a Harold Bennett art exhibition, featuring his British landscape scenes, this particular one of Killarney. Backstamp: Britain Beautiful Burleigh Ware Est 1851 B & L Ltd England Reg Trademark Killarney. A few minor blemishes and signs of age, overall excellent condition. 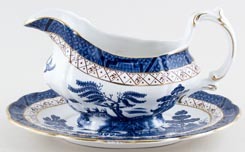 Very attractive sauce boat with decorative moulded detail to the handle. Backstamp: Non Pareil Burgess and Leigh Middleport Pottery England. There is the occasional minor manufacturing blemish and around the handle a little minor parting of the clay which would have occurred during firing, otherwise excellent condition. Burleigh with gilt. This boat rather resembles a jug, so I guess it is a multi-purpose piece! the gilt is worn otherwise it is absolutely fine. With gilt. This is the very pretty stand for the Burleigh sauce boat with pretty moulded side handles. Backstamp: Burleigh Ware Willow Made in England. The gilt is very worn otherwise excellent condition. With gilt. An unusual sauce boat stand for Burleigh as it is oval with a wavy rim. Backstamp: Burleigh Ware Willow Burslem England Made in England. Minor surface scratching and a little wear to the gilt otherwise excellent condition. Without gilt. Typical blue printed backstamp Burleigh Ware Willow Made in England.